When I shopped at Greenmarket last week, I did not limit myself to fiddleheads, even if they were my most exciting purchase. The market brimmed over with spring greens! Spinach, of course – sauteed with eggs for lunch the other day. Meltingly tender Swiss chard. Arugula – so that’s what I’ll serve with the Peanutty Chickpea Spread until I get cucumbers… Tender little turnips and their greens, which I just barely heated through – they were too delicate to need more! So it’s time for my annual post on the basic method of cleaning and cooking greens. I’ll write about greens of all kinds from now until November, and will refer back to this post… I use this technique for all greens except collards and winter (curly) kale, which are too tough for it. (Well – at this time of year, I can even get baby collards tender enough for this!) And while this works for the turnip greens I get, I understand that some cultivars do need the same long simmering that collards do. But spinach, chard, beet greens, all do well this way. First, you need to wash them – and this is the same for even the toughest collards and kale. Greens are grown in sandy soil. The ones in supermarkets – especially the packaged ones – have been through commercial cleaning (which does add a few days to their journey to your kitchen) but still benefit from further washing – nothing like a bit of grit to ruin your lovely dinner! And some greens direct from a farmer may even need two (or more!) rinses, until you are certain they’re clean. So – take your greens, and lay them on a cutting board. Cut off the ends of the stems – and how much you cut will vary by their texture and your taste. Most spinach is tender, most kale is stringy, anything that has sat a while since harvest will be tougher than it was. I happily eat chard stems, but many people do not. Use your own judgement… And then, chop the rest into bite sized pieces. 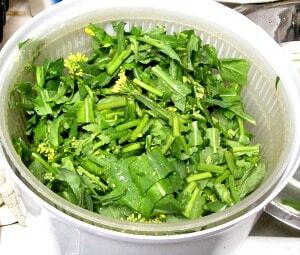 Fill the sink or (as I do) a large bowl with water, and put the chopped greens into it. Swish them around thoroughly. Then lift them up and out (I often use a Chinese spider strainer to get all the floating bits) and drain. I often use a wire strainer I can hang over my sink, but I know that’s not an option for most of you – a salad spinner works fine. The trick here is that you don’t want them dripping wet – but you don’t want to dry them completely, either. You’re going to cook the greens in “the water clinging to their leaves” as it is usually phrased. Once they are just damp, shall we say, take a large pan and heat it. I like a saute pan or wok, but any large fry pan will work. This is the time to add other flavors, if you are so inclined. I just heated a little olive oil, here, but sauteing some garlic and chili pepper in that oil is a wonderful combination with broccoli rabe. Sometimes I’ll chop a little bacon and render it out, maybe add onion, and use that to cook spinach or kale. You can use a neutral oil and curry spices, or any other seasoning that you would like with the rest of your meal. Once the oil is heated, and any seasoning you choose to use is ready, drop in the greens. Stir them well – I don’t know how I did this before I started using tongs in the kitchen! – to coat lightly with the oil, which will start them wilting at once. If they don’t all fit, put some in, stir, and add more as they wilt down – it’s astonishing how far most greens cook down. Keep tossing, you will watch them turn a brighter, more intense green, as they become tender. Cooking time varies considerably. Very fresh, very young spinach is cooked almost as soon as it heats through. 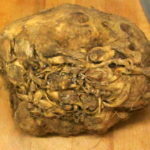 As the summer wears on, even the same kinds of vegetables start to take longer… Watch it, maybe taste a bite, you’ll get to know what it looks like with experience. And there you are. 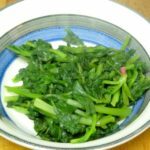 Sauteed broccoli rabe – or spinach, or chard, or kale, or… They have different flavors, and different textures, but are still generally interchangeable in recipes. Now, the rabe is a classic added to an Italian bean soup, but try it on the side, or with eggs – or indeed in any recipe where you might use cooked spinach. And enjoy it now, while it is available! 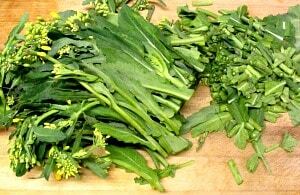 Broccoli rabe, and cooking greens - the basic method I use to wash and prepare a wide variety of leafy green vegetables. Trim stems and tough parts of the rabe. Chop the rest in bite sized pieces. Fill a sink or large bowl with water. Add the greens and swish around to wash. 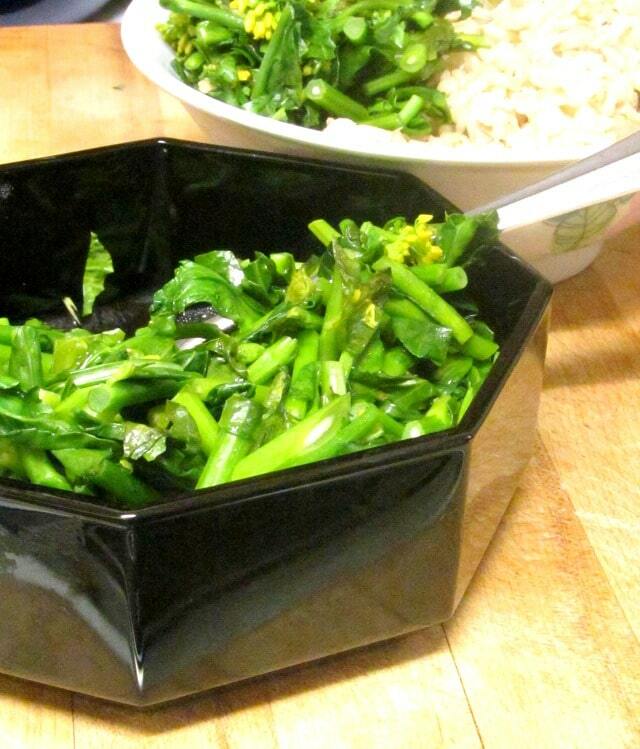 Lift them out, leaving dirt and grit behind, and place in strainer or salad spinner. Dry until still just damp, not dripping, but with some water clinging to leaves. Heat a saute pan or large fry pan. Add oil and heat. If desired, add minced garlic (or other seasoning) now, and saute. Add greens to pan. Stir well to coat with oil. (The easiest way I know is to use tongs.) 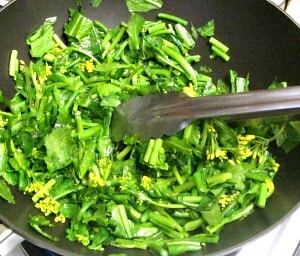 Continue stirring periodically while the greens cook down, until they are cooked to your taste. 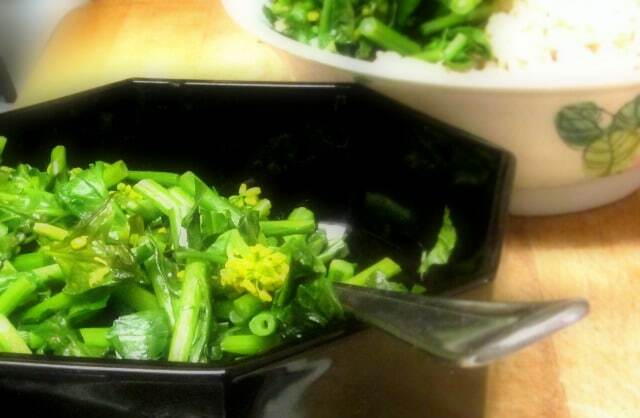 I love sauteed greens, although I have never tried broccoli rabe. I love the addition of chili and garlic to the oil! I'm glad to introduce it to you! That's a classic seasoning for this - but I also love it in chard. 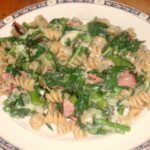 The simplest variations are wonderful with greens. 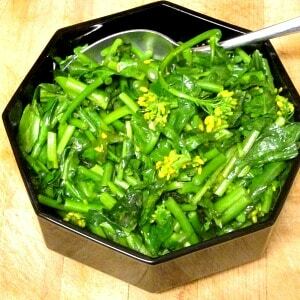 I adore broccoli rabe, and this is a great post for someone who has never worked with it before! New veggies can be intimidating for sure! Thank you! It's such a spring treat here... But yes, I spent enough time standing at a farmer's market wondering what to do with greens. They just weren't available around here when I was growing up, but luckily my mom had cooked chard and beet greens up in the country, so I had some clue... (though to my current taste, she overcooked them.) At least I knew I could cook them! This is such good information! I get into such a rut with my vegetable sides that anything that is vaguely new or different to prepare starts to feel so intimidating. It's great to have this resource. And the broccoli rabe sounds really tasty. Definitely not a veggie that was on my radar before. I totally understand. I grew up with a poor assortment of not very fresh "fresh" vegetables - so we ate almost entirely frozen, because, bluntly, the quality was better. The assortment, though, was limited. And that is still true in many places. But where a farmstand opened near my grandmother's my mom introduced us to vegetables the way they can taste... and I've been hooked ever since. And Greenmarket, and now the CSA we belong to not just give us variety but challenge me at least once a summer... Poke around the blog a bit - I cook a wide variety of vegetables, in different ways. Plenty of ideas! (And feel free to ask me questions, if something isn't clear, or you just need more information. I do see comments, even on old posts, and am happy to answer them! What a yummy flavor combination. 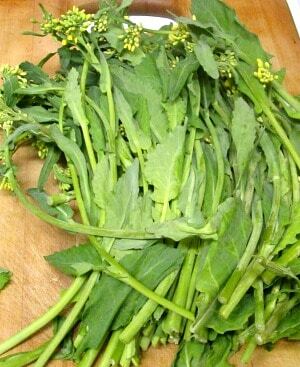 I love broccoli rabe and even tried to grow it in my garden last summer. It seems that it gets far too hot here. Mine turned to flowers and became very fibrous and chewy very early on. For now, I'll setting for buying it in store or at the farmer's market! It is an Italian vegetable, but also a very early spring one - you probably could grow it but you'd have to catch it really early. May not be worth it if you have to be sure to get it all in that one magic week... I'm glad you can buy it, though. Enjoy it! I think this sounds like an idea summer dish! Simple, colorful and oh so yummy! We eat greens a lot in summer, and that's one reason. Rabe will be gone, soon, it's a spring vegetable - but I do the same with chard, and kale, and beet and turnip greens... 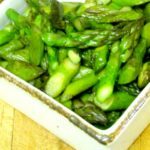 The same basic technique, more than recipe, with a variety of greens and seasoning give astonishingly different results! Try it, and enjoy them!